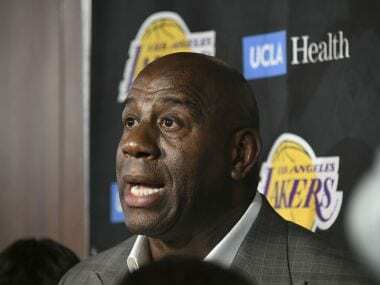 Los Angeles: Magic Johnson stunned the basketball world on Tuesday, abruptly resigning from his management role with the Los Angeles Lakers and plunging the ailing NBA franchise into fresh turmoil. "Today, I'm gonna step down as the president," Johnson told reporters at an impromptu press conference. He told reporters he was stepping down in order to preserve his friendship with Lakers owner Jeanie Buss, describing her as "like a sister." "(Jeanie Buss) and I have such an amazing relationship," Johnson said. "She gave me full power to do what I wanted to do, but I think that with her and I, I want to always preserve our relationship. "I had more fun when I was able to be the big brother and the ambassador to everybody. I had more fun on the other side than on this side." "There is no greater Los Angeles Laker than Earvin Johnson," the team said. "We are deeply grateful to Magic for all that he has done for our franchise, as a player, an ambassador and an executive." "Tomorrow I would have to affect someone's livelihood and their life," Johnson said, without referring to Walton directly. "And I thought about that. And that's not fun for me. That's not who I am. I don't want to put (Buss) in the middle of us. "Even though she said 'You do what you want to do.' I want to go back to having fun. I want to go back to who I was before taking on this job." "We're halfway there with LeBron coming," he said. "I think this summer we've got other stars coming in. This team is going to be in (a) position to contend for championships." "She doesn't know I'm standing here because I know I would be crying like a baby in front of her, even though I'm about to cry now," Johnson said. 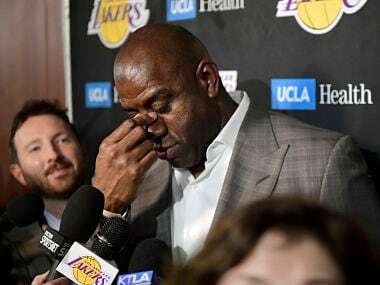 "But it's the right thing to do, the right move to make," Johnson said, adding that he had also grown tired of "the back-stabbing and the whispering" that had dogged the Lakers' season. "I didn't like that," he said. "I hope that after that, the Lakers can head in the right direction." Los Angeles Times sportswriter Bill Plaschke compared the sense of shock to when Johnson had announced to the world he had the HIV virus in 1991. 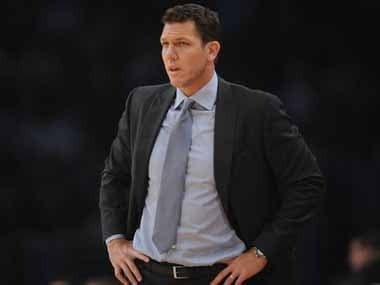 "It throws everything into complete chaos in the Lakers front office," Plaschke said. "Just stunning, stunning, stunning. I don't know where they go from here. "I think the criticism hurt him, the responsibilities of the job weighed on him, and with his other businesses, it became too much. It was a great idea to have him his as president but I think it was too much for him. He couldn't be himself. "He didn't want it anymore."